There might be a time, Sol Campbell wondered, when a black manager in English football's top four divisions is less remarkable than it is in 2018, but for now one of the game's most celebrated black players taking his first steps in a new career still felt like a big moment. At Moss Rose, the home of the club 92nd in the professional game, they are running out of chances, without a manager since October, and it is amid that mood of desperation that their new man, with his sprinkling of star dust, has arrived. This giant of several England teams, now 44, seemed at times an incongruous figure in the McIlroy Suite, the most presentable part of a tired little stadium. 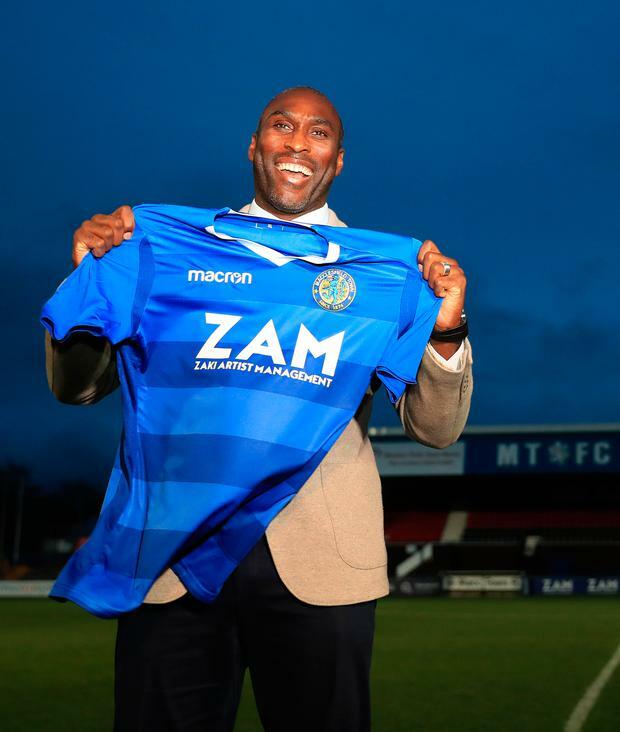 For 20 years and over 73 caps, Campbell was one of the most recognisable figures in the game, and now here he was trying to rescue Macclesfield Town from sliding back into non-League. It was, all told, an assured performance from Campbell, who had thought hard about how he presented himself in his new life as a manager. He did not ignore the question of race which he has been outspoken about in the past, but decided that is a fight for another day, while he turns his attention to a League Two relegation battle. "I'm not going to go down that road and state the obvious," he said. "I've got an opportunity and I'm going to take it with both hands." He is one of just eight black or ethnic minority managers working in the professional game and, at times looking back at his England career in particular, and the captaincy, he has concluded that the FA suffered from institutional racism. At Macclesfield, Campbell said his one hope was that one day the appointment of a black manager was no longer worthy of remark. "I hope I'm not judged just on success, I hope I'm judged on what kind of ship I run," he said. "In the end, hopefully the football wins and people start looking at all scenarios. I just want to become a manager, forget what colour you are, that's the way it should be." Otherwise he was eager to turn his focus on a team four points from safety and heading back to the National League from where they were promoted in May. He chuckled when the remarks of another former Macclesfield manager, Paul Ince, were put to him, that Campbell had to start at the very bottom club while others, such as Frank Lampard and Steven Gerrard, had been handed much more viable propositions. "You have to start somewhere," Campbell said. "I am prepared to start anywhere. The opportunity came up and there was no messing about. It was very clean. It was one agent and the owner, very simple and I like that, a little bit old school. I felt it was the right time." He spoke to the players at half-time of their recent victory over Exeter City, the second consecutive 1-0 win in what has been a mini-revival. He took his first training session yesterday, keen that his players should hear directly from him first, "not through television or radio". He talked up the squad but also emphasised his contacts would be used to get "hungry" players on loan. Campbell estimated that as many as 15 job applications or appointment processes over the last seven years had come to nothing, including one interview that had involved a 10-hour flight. But he was all the better equipped for it. What had kept him going, through all the rejections, when he could have just done something else rather than manage the lowest-ranked club in England? "Passion," he said. "I think about football all the time. I like strategy, I like the whole buzz of it. I love building teams."